You must make reservations at least 5 minutes in advance of the time at Boathouse Collective. Outside catering available. We can customize our catering options to accommodate your needs. Contact us to design your catering package. Boathouse Collective is Costa Mesa's premier restaurant and venue hosting a variety of art, live music, signature cocktails and fresh, thoughtfully crafted Southern California cuisine. 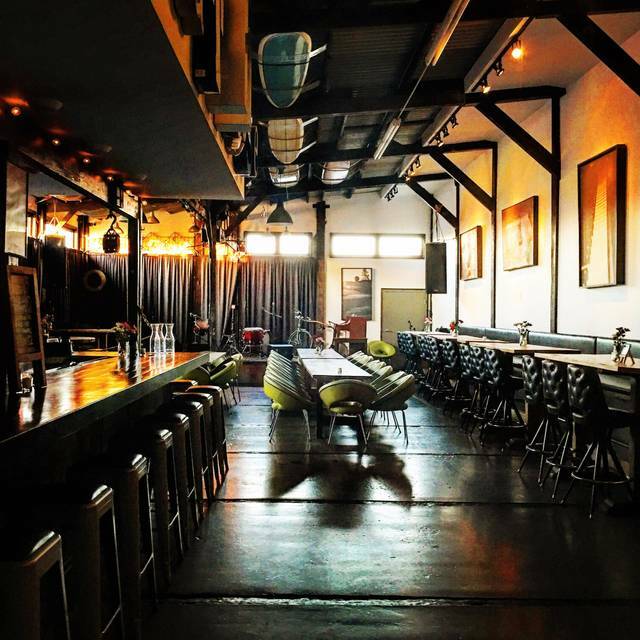 Boathouse Collective, a former private event space operated under the same name, has reopened as a multimedia venue showcasing flavorful foods, creative cocktails, art shows, live music performances and special events in westside Costa Mesa. Boathouse Collective offers dinner service as well as happy hour and Experimental Sundays will be soon to come. 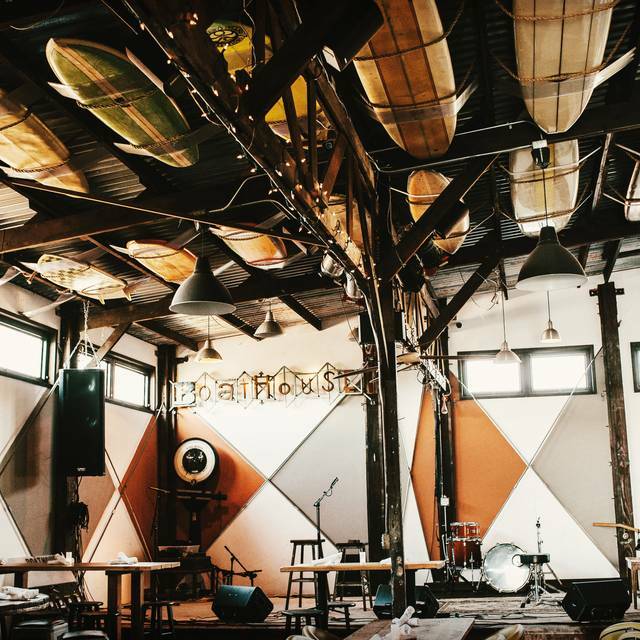 Founder, artist and visionary behind the Boathouse Collective, Clayton Peterson, a native of Costa Mesa and Newport Beach, recently rebuilt the space using all reclaimed materials and vintage objects, transforming the space into a full service restaurant and venue. The design maintains the building’s historical and rustic character while exhibiting an artistic and creative aesthetic that suits the industrial westside Costa Mesa neighborhood. Great food and good vibes. Great space and vibe with unbelievable attentive service and excellent food. Had a great time hanging with friends and enjoying the live music. I have tried going here many times. But my timing was off. It was always Sunday and they are closed on Sunday 😟 but this time I looked on open table for a reservation around 6:30 and low and behold Boathouse had one!! Super excited met up with our friends no kids! There was a band! They were fun! Good cover band!! I will definitely be going back! We shared the ribeye 🥩 yummy and they gave us this sweet potato with some miso something sauce it was to die for!!! 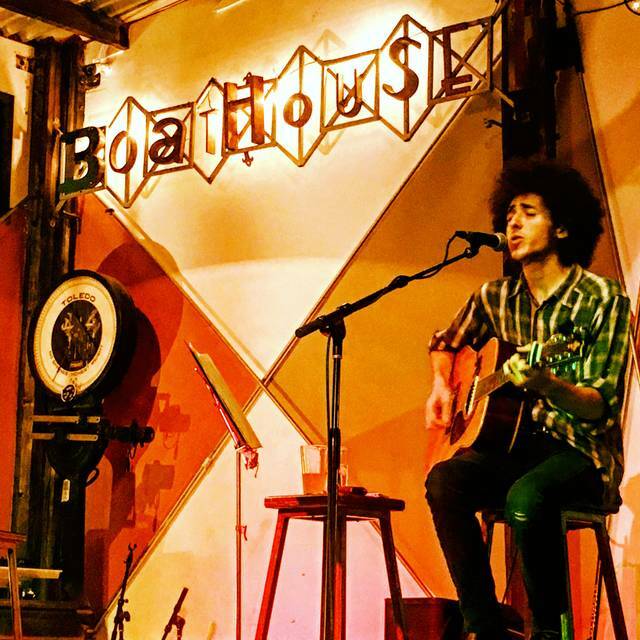 Boathouse Collective little hidden gem in our lovely city Costa Mesa! Good food, good live entertainment. Their tap beer selection was excellent too. 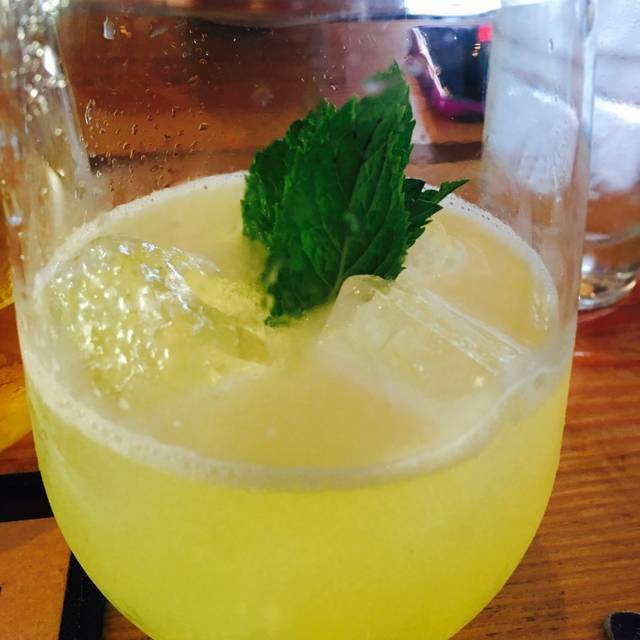 The food is great, the drinks are great, the atmosphere is great, the service is horrible. I've visited close to 10 times in the last couple of years, hoping the service would pick up each and every time, and it hasn't. It's some of the worst service you'll find in OC, which is very frustrating... which is too bad because other than that it's a very cool spot. Nice place to spend an evening with friends. Good food, good service, good band playing and interesting decor. Had a great time. Great find! Cool place with live music. Great cocktails, maybe a bit too sweet but didn’t stop me from having several. Food (salmon, filet bits, and rib eye) was fabulous especially, especially the rib eye! We’ll definitely go back when I’m in town. My friends and I went here while we we’re visiting because it was so well reviewed. I wanted so badly to enjoy this, but it was such a disappointment. It’s very hip in how it is styled, and they do have room for live music, though there wasn’t any the Saturday night we went. The food was overpriced for the portions, and just not good. My friend got the fish and it was just gross. The only exception being the burger my sister got, but you can get a burger anywhere. The server we had was absentee. No water refills, no how is your food, just what do you want and here’s your check. We were trying to order more wine and couldn’t because he simply never came back - a food runner brought us our orders so we didn’t even see him then. To add insult to injury he split our check incorrectly (we just let it go and paid the split as-is) and it was stupid loud for such a small space. We won’t come back; such a letdown. Off the beaten path but a good find. Vibe was great; food and service as well. The owner Clayton even came by our table to introduce himself and welcome us. Recommend the salmon. Great night for a friends birthday get together. Service was great and food incredible. Love this place. The food is amazing and the staff is great. Live music is awesome! Everything was great, including the service. Personally, I thought the Jidori Chicken was wonderful. The Carrot Cake was also delicious. We will certainly be back. This was our second visit to the Boathouse Collective. Once again, the food was amazing and the atmosphere is perfect. Our waitress was friendly and interactive. Her service was exceptional! We will definitely be back again. Amazing waiter, cool atmosphere, and my meal was amazing - grilled artichoke appetizer and scallop special. We met a very interesting couple at our table making it a truly memorable evening. We were seated in a back room away from everything. That should be disclosed on the app before you book. We had not been here for a few years but really like the updates and changes. Shared tables and great music. This started with us waiting 30 min to get our drinks and went downhill from there. It was amazing, great food, great music and perfect for a birthday get together! Had a recent visit to the Boathouse Collective for a great meal, had the catch of the day. Yellowtail fish with a sticky rice side. Enjoyed the live music of our dear friends LMT Connection hailing from Niagara Falls,Canada. Can’t wait to come back for a visit to Costa Mesa. Beautiful place. I would highly recommend. We went out for dinner and drinks. Never disappointed. Definitely will refer it to family and friends. All great! Make reservation before going. I was new to open table app, but will use before for being inside with band. We had an amazing time celebrating our anniversary! The hostess not only did not greet us, but she walked and, and then away with an ipad in hand. When she returned I told her we had reservations and gave out name, the only words from her were "here's your table, a 6 top , that 2 were already seated at (total strangers). We looked at them, then at each other, but the hostess had departed. We ordered a what I thought was an $8 cocktail (it was $14) and a black coffee, this restaurant does not serve COFFEE?! Not even a cold brew unless you put alcohol in it. Lol. We ordered two different fish dishes and a salad to split; they did not bring us a plate to split it on. The waiter told us he could swap the veggies (not on my diet) to another veggie side dish, but instead of swapping, they mixed the other veggies in? The band was good, but things were not going any better with the service, so before we could ask for our check, another couple was brought to the table to be seated. Seriously. I had to get out of my seat and let the other new couple squeeze in. The table next to us was open, but they would not seat them there. Everyone seemed very uneasy. We told the new couple we were leaving so they should invite a friend so at least they would not shove someone other couple into the tight seating space. Bizarre at best. Has potential though! The servers didn’t know who was serving our table- I think the host ended up just becoming our server unofficially. Super loud! Food was good though. Such a fun date night! Orange coast winery is 10 minutes (walking distance). Dinner came before appetizer so we cancelled. Table next to us came after and got the appetizer we ordered before we canceled oura. A member of my party ordered the special Wagyu Steak and received it 25 minutes after we got our dinner. It was super fatty, terrible cut. Not like a Wagyu at all. They need to learn how to time the kitchen to table better for a group. 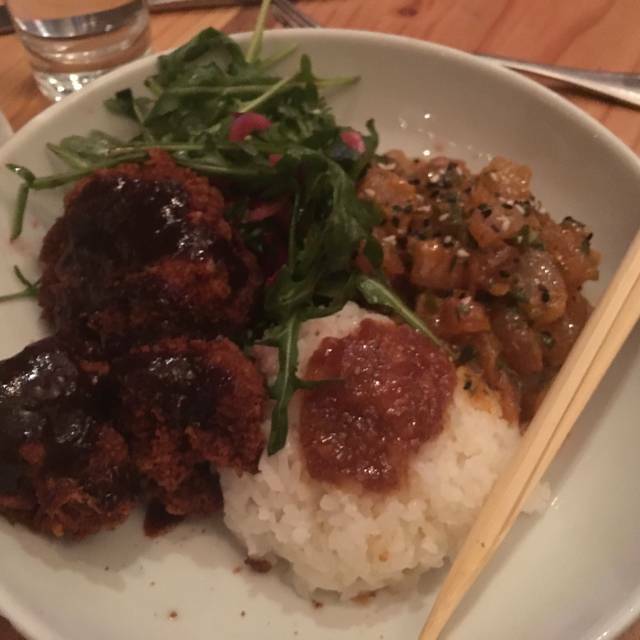 We were so pleasantly surprised, and will definitely be going back for more... the food, the ambiance, the service...lots of delicious food choices, vegan, vegetarian, and also meat and chicken, so fresh. Asian fusion flair, so good, loved the music. What an outstanding restaurant. The chef has done a great job of integrating aspects of Japanese food with more standard fare. Every dish we had once great. Staff is accommodating, especially if you are not familiar with an food item. 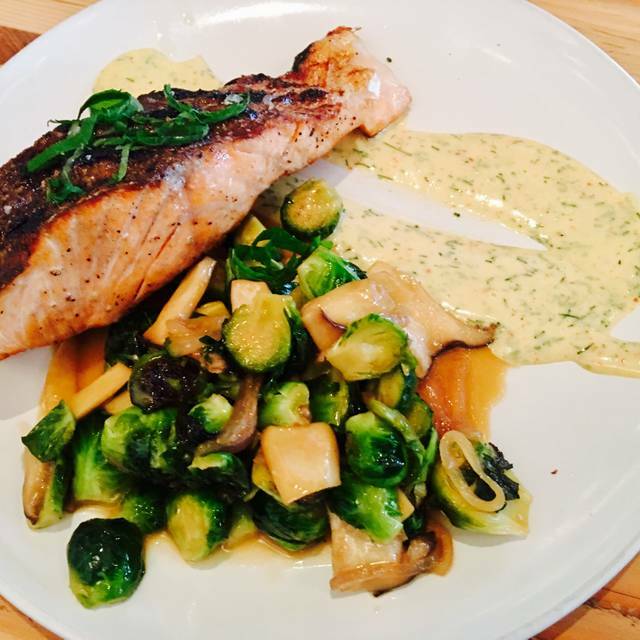 We modified a standard menu item with the fish of the day. Came out perfect. Chicken Katsu is very good. Have it as an appetizer or in the bowl with Ahi Poke. Look forward to going back for Ramen Tuesday. Great place for my holiday team get together! Super fun vibe. Casual, edgy, industrial/barn-like feel. Really good food (Chicken dish was delish!) and innovative cocktails. We were there on a Fri. night before Halloween - the crowd was pumped & the band was amazing. Can't wait to go again! This was our first visit to this restaurant and we will definitely be returning. 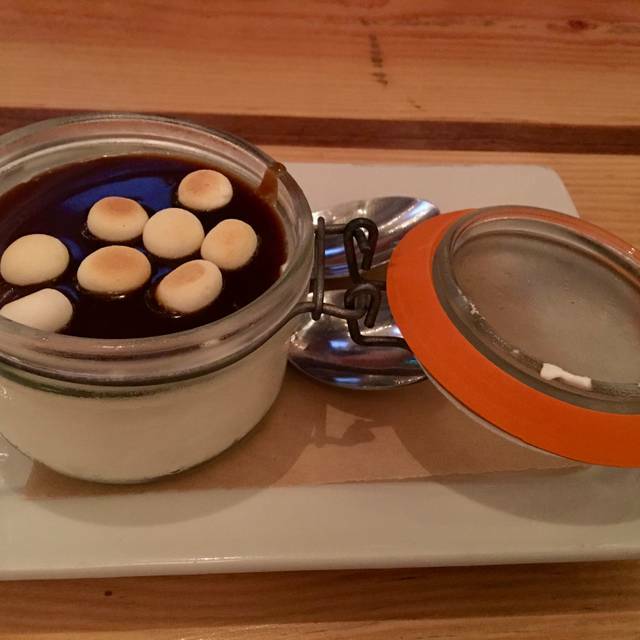 The food, the atmosphere and the service were excellent. Great local spot with live music and art. Outstanding cuisine & cocktails. Love the interiors. Nice outdoor seating too. I went to the Boathouse with three friends and we all had a great time! The appetizers were perfectly done, the entrees were all delicious, and the desserts plates scraped clean. The prices were low considering the high quality of the ingredients. I had the salmon which was outstanding! 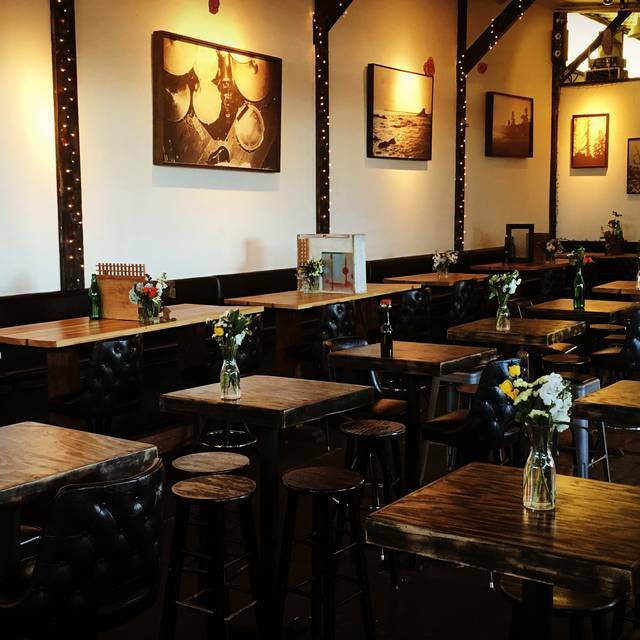 The ambiance is not your typical Newport corporate restaurant its authentically cool. It has a hip vibe. The awesome band came on at 9:00ish. It was The Sound of Ghosts. They seemed like classicly trained musicians and the vocalist was top notch! People danced and had a great time. All in all it was a very fun and we will be back. Great spot. Good music. Chef Royer is amazing! I would definitely recommend this place. Looking forward to my next visit.